or those Catholics who have not received the other Sacraments of Initiation (Eucharist & Confirmation). RCIA sessions begin in September of each year and run through the Easter season. After an inquiry period of 6-8 weeks, participants then decide if they wish to continue on their journey to come into full communion in the Catholic Church. When and where does RCIA meet? We meet on Tuesday evenings in the Rectory Basement. We start at 7:00 pm and finish around 9:00 pm. How long does RCIA last? RCIA begins each year in early September (usually the first Tuesday in September) and ends about four weeks after Easter. Since the date for Easter changes every year that puts us into April or May. RCIA is not just a matter of learning about the Catholic Faith. It’s a process – a journey that you take with the RCIA Core Team and the rest of the parish. Through this process you will not only learn about the Faith but you will also begin to feel a part of the parish. Most importantly, your relationship with God will deepen and grow – and that takes time. Are there any other time commitments? Yes. Beginning in late October or early November we’ll ask you to start attending the 10:00 Sunday Mass at our parish. We’ll all sit together and you’ll begin to get comfortable with understanding and participating in the Mass. Right after the homily (the sermon) the priest will give the Catechumens and Candidates (that’s you) a blessing and send you off with a member of the Core Team to talk about the Scriptures that were read at Mass and how they apply to your life. 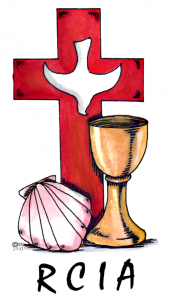 We also have a Day of Recollection (a retreat) at the parish a few weeks before Easter and we have a very special day (usually a Sunday) when we make a trip to the Cathedral for a very special Rite (ceremony) with the Archbishop. What if I start RCIA and then decide that it’s not for me? That’s no problem. In fact, that’s part of what RCIA is all about – discerning if this is the path for you to take at this point in your life. There are two places in the process where we sit down with you, one-on-one, and ask if you want to continue – the first is about 8 weeks in, the second is right at the start of Lent (in February or March). But if you decide at any point that you don’t want to continue you can simply tell us and be done right away. What if I can’t come on Tuesday evenings? If your schedule prevents you from coming on Tuesdays, there are at least two options. One of the priests of our parish can meet with you one-on-one to teach you about the faith. While you are doing that we would also like you to try to participate in the other activities of RCIA (see above under Are there any other time commitments?) Another option is to attend RCIA at a different Catholic parish – one that offers it at a different time of the week. I’ve never been baptized. Is RCIA the right place for me? Absolutely. You are the person RCIA was originally designed for. You will be known as a Catechumen (someone who’s never been baptized). RCIA is the perfect place for you! I’ve been baptized in another Christian faith but I’m thinking about becoming Catholic. Is RCIA the right place for me? Yes! As someone who has already been baptized, we consider you to already be a brother or sister in the Faith. We highly respect your baptism and you will be known as a Candidate for the Faith. We encourage you to sign up! I was baptized as a Catholic but I never received any of the other sacraments. Is RCIA the right place for me? Yes it is. This is where you will learn your faith from an adult perspective. Whether you’ve been a practicing Catholic all your life or not, this is the place for you! I’ve been a Catholic for a long time. I’ve been baptized and I made my First Communion when I was a kid, but I’ve never been confirmed. I’ve also been away from the Church for a while but I’m ready to come back now. Do I have to go through RCIA? You basically have two options. You don’t have to go through RCIA but you may find that you want to and we would recommend that you do. Most people who have made their First Communion but have not been confirmed had their religious education stop while they were a child. RCIA is a great way for you to really learn what the Catholic Church teaches and to begin to feel a part of it again. If however, you would rather not go through RCIA, then simply give one of the priests a call and they’ll tailor what needs to be done according to your specific circumstances. I have been a Catholic all my life and am still a practicing Catholic. I go to Mass every Sunday and receive the Eucharist but I missed out on being confirmed when I was younger. Do I need to go through RCIA? You are most welcome to attend RCIA and to be a part of it. But you also have another option available. Every year on Pentecost Sunday (usually in May) the Archbishop confirms adults who are practicing Catholics but who have never been confirmed. This takes place at the Cathedral in St. Louis. Please talk to one of the priests of our parish if you would like to go that route. I’m in high school and I’m thinking about becoming Catholic. Is RCIA the right place for me? Yes. We have had a number of high school students go through the RCIA process. And we have loved every one of them! We find that the young people really enrich the program for everyone. Please feel free to contact us. I’m interested in going through RCIA and I have children that I would want to become Catholic as well. Do they attend the RCIA sessions with me? No, with one exception. If your children are in high school or older, then yes, RCIA is exactly where they should be. However, at that age, we will make sure that they are becoming Catholic because they want to and not just because Mom or Dad wants them to. If you have children who are in grade school (Kindergarten through 8th grade) we will recommend that you put them in a Catholic education program appropriate for their age. At our parish we have two options: (1) the parish day school (Seton Regional Catholic School) or (2) the Parish School of Religion (which meets once a week on Wednesday evenings during the school year). You can follow the links under the Education tab for more information on both of these. I have other questions that aren’t answered here. How can I get answers?